Sept. 5	The NonRefundables. The NonRefundables are a fun-loving rock quartet from the Wyoming Valley who combine high energy with clever writing. The band has been winning fans around Northeastern Pennsylvania, and now they make their Homegrown Music debut with a passel of original songs. Sept. 12	Van Wagner. Danville, PA's prolific acoustic singer-songwriter returns to Homegrown Music for a new collection of his enjoyable, creative and thoughtful songs, frequently with bluegrass influence. Sept. 19	Lex and Joe. Lex Romane and Joe Riillo were two of the first people to appear on Homegrown Music in the mid 1970s. They have been based in the state of Maine for some years now, but they return to Northeastern Pennsylvania fairly regularly. During one of those trips, Lex and Joe stopped by WVIA and recorded a bunch of songs for Homegrown Music, which are heard in this encore from 1999. Sept. 20	A Homegrown Jazz Special with WAYNE SMITH. From the Clarks Summit area, Wayne Smith is a talented jazz pianist with an extensive musical background. He makes his Homegrown Music debut performing a collection of original pieces plus jazz standards in a solo instrumental setting. Note: Air time 7:00 PM during WVIA's All That Jazz. Sept. 26	Cathy Donnelly. This time Homegrown Music gives a new spin to presenting musical talent from "out there in Radioland." 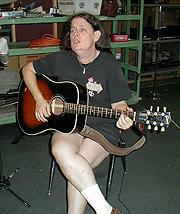 When she is not heard on local station WDMT ("102 The Mountain") Cathy Donnelly writes and performs bluesy original songs, many of them cleverly humorous. She pays a visit to WVIA and has a chance to perform her fun music, and in the process, make her Homegrown Music debut.